IIFA Utsavam Awards 2015 Telugu Nominees & Winners List: IIFA (International Indian Film Academy Awards) organisers have been decided to conduct a new awards show to honour the South Indian Film Industry technicians. i.e. IIFA Utsavam Awards. IIFA Utsavam Awards presented to the winners in Telugu and Kannada Film Industries on 25th January 2016 in Gachibowli Outdoor Stadium, Hyderabad. Due to the massive floods in Chennai the first ever SIIMA Utsavam Awards has been postponed to January 24 & 25, 2016 from December 4th, 5th & 6th 2015. Baahubali has been nominated across a whopping 14 categories and Srimanthudu which has been nominated in 11 Categories. 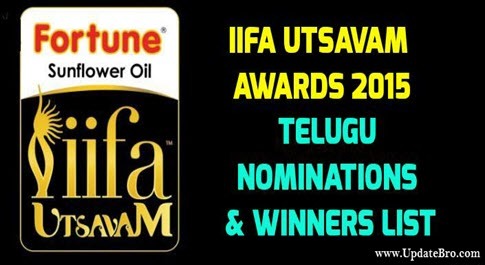 Here is the complete list of IIFA Utsavam Awards 2015 Telugu (Tollywood) Nominees / Nominations & Winners List. Here is the complete list of 2015 Telugu Nominations for The IIFA Utsavam Awards. Here is The Complete List of Winners in IIFA Utsavam Telugu Awards 2015. Hope you like this IIFA Utsavam 2015 Awards Telugu Nominees and Winners List. If you like this, Then please share it to your friends. Hyderabad Central University Student Rohit Vemula Suicide: Full Story. IIFA Utsavam Awards 2015 – 2016 Tamil Nominees & Winners. IIFA Utsavam Awards 2015 Malayalam Nominees & Winners. IIFA Utsavam Awards 2015 Kannada Nominees & Winners. I m little disapointed with best actor male, Mahesh babu did a great job in shrimanthudu he deserves the award but prabhas performance in bahubali was extraordinary he worked hard and he completely deserves the award than anyone ….. I also disappointed in best actor male Mahesh babu, Prabhas do the Superb performance in bahubali but…….. ? Nani deserves truly….what is so good in Srimanthudu about Mahesh?? Its a cheating na! Prabhas and mahesh babu get equal votes and how could u give it to mahesh babu? ?